The church is also known by the name of Santa Patrizia, whose remains are preserved inside the church, and San Liguoro, (San Gregory). The Benedictine nuns are still present in this church. The adjoining convent was once very wealthy, as the nuns belonging to noble families, continued to lead a comfortable life here. In the 8th century, the iconoclast decrees in Greece caused a number of religious orders to flee the Byzantine empire and seek refuge elsewhere. San Gregorio Armeno was built in the 10th century over the remains of a Roman temple dedicated to Ceres, by a group of nuns escaping from the Byzantine Empire with the relics of St. Gregory, bishop of Armenia. In 1009, the monastery was joined with that of St. Pantaleone, founded by Stefano II, adopting the Benedictine Rule. The merger of the two religious structures was through an overpass passing on the road, creating a walkway between the two buildings. Between 1572 and 1577 the architect V. della Monica rebuilt the convent; the Church was reconstructed on the project by G.B. Cavagna (1574-80). 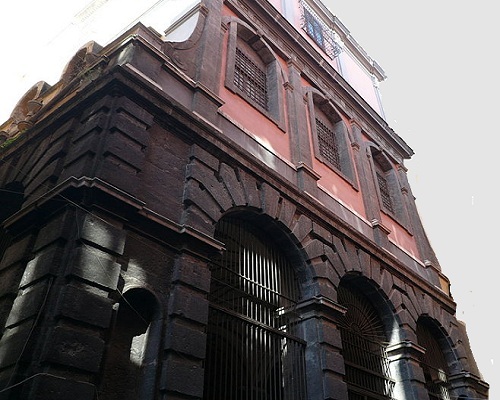 The façade has three arcades surmounted by four pilaster strips in Tuscan order. 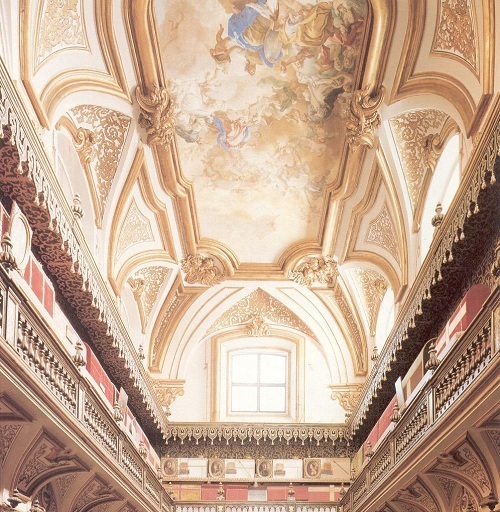 A samptuous wood ceiling designated and painted by Teodoro d'Errico greets visitors, the interior has a single nave with five side chapels: the decoration, with the exception of the five chapels, was finished by Luca Giordano (also author of the Saints over the windows of the dome) in 1679. The ceiling cassettoni or framed canvases depict the Life of the St Gregorio Armeno and were commissioned by the abbess Beatrice Carafa from the Flemish Teodoro d'Errico. Bernardino Lama, likely the son of Giovanni Bernardo Lama, was author of the altarpiece. The interior also houses also the famous Holy Staircase, used by the nuns during their penitences. Designed by Nicolo' Tagliacozzi Canale is the golden gate enclosing the precious choir stalls and the two Baroque organs. 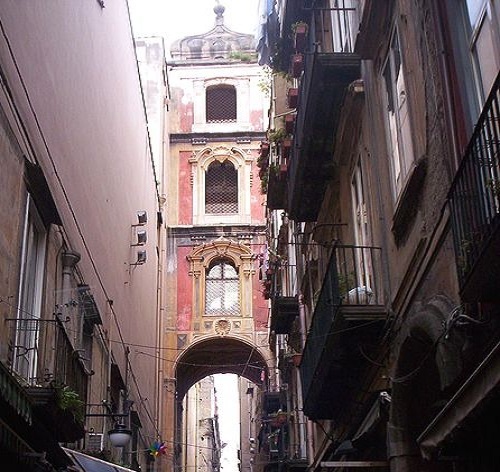 The bell tower of the church is located on the homonymous famous shopping street (Via San Gregorio Armeno) known as "the street of nativity workshops". On the right, the altarpieces include an Annunciation of Mary by Pacecco De Rosa, a Virgin of the Rosary by Nicola Malinconico, frescoes by Francesco Di Maria, on the left, is an altarpiece and a St. Benedict, by Spagnoletto. 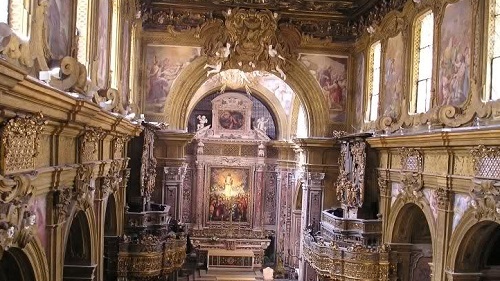 The main altar was designed by Dionisio Lazzari, and has an Ascension by Giovan Bernardo Lama in the presbitery. The Idria Chapel houses eighteen paintings by Paolo De Matteis, portraying the Life of Mary. Over the chapel's high altar is a medieval icon, in Byzantine style, of the Madonna dell'Idria. 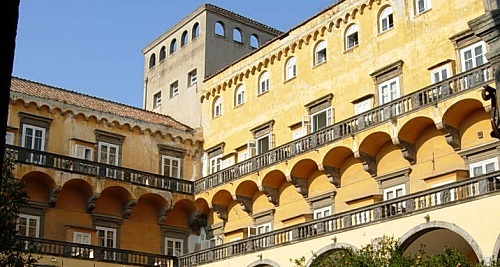 The convent: Founded in the eighth century, the present structure is the work of Giovanni Vincenzo Della Monica (1574) and Francesco Antonio Beaten (1644). 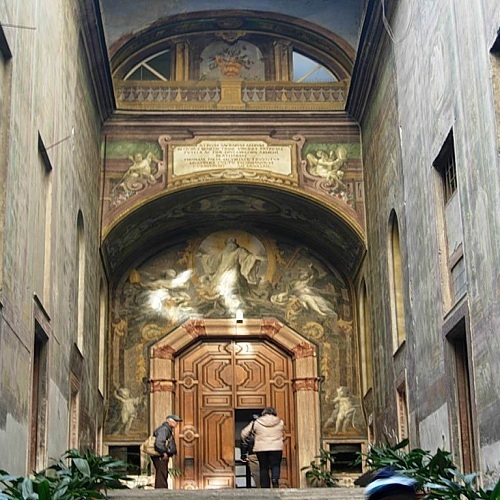 The entrance is highlighted by a wide staircase and the walls adorned with wonderful frescoes by Giacomo del Po, Bardellino and Alafani. The atrium leads straight into the cloister featuring a large baroque marble fountain designed for the Abbess Violante Pignatelli, flanked by eighteenth-century statues depicting Christ and the Samaritan Woman, by Matthew Bottigliero (1733). 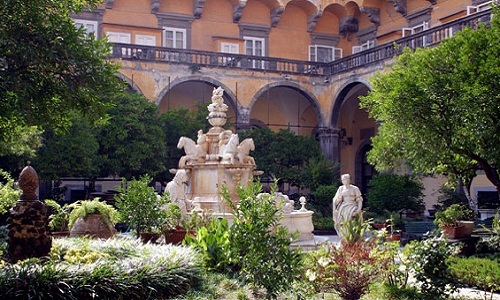 All hortus conclusus (the garden) is planted with orange trees.